Established in 1975, Scottish-based manufacturing company Zot Engineering Ltd began life by specialising in the production of single-sided circuit boards and associated sheet metal work. Prompted by customer demand, continuous expansion of capacity and range of competences means that it is now able to undertake a comprehensive range of activities including sophisticated through-plated and multilayer boards, machining, electronic assembly and test. Now employing more than 230 people, last year Zot generated a turnover of over £14million; Zot is able to offer complete turnkey solutions, from conception, through development, to completed product realisation. Reflecting the company’s broad range of capabilities, potential customers can now take advantage of any combination of the company’s three specialised manufacturing divisions - Printed Circuit Board manufacturing, Assembly and Sheet Metal Fabrication. Reflecting the company’s quality ethos, Zot Engineering recently made a significant investment to help ensure the continued quality of its output. Zot Engineering’s General Manager, Gordon Falconer explained “In addition to the growing need for First Article Inspection Reports, customers’ precision requirements within areas such as board edge to feature, board edge to hole and feature to feature measurements, are constantly increasing. To help enhance our capabilities in these areas, we recently undertook a search for a suitably accurate means of high-precise measurement. 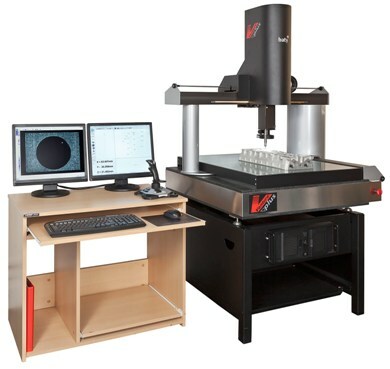 Having thoroughly investigated the alternative systems, we purchased a Venture Plus, CNC, Coordinate Measuring Vision System from Baty International. Not only did the advanced Baty offering outperform all of the other systems that we considered, the global popularity of the Venture Plus within the PCB industry gave us the confidence to make the purchase. The nature of our PCBs means that the highly accurate, non-contact characteristics of the Venture Plus are now proving ideal for our use. As our new Baty Coordinate Measuring system has full CNC capability and a generous stage size, we have the option of measuring one-off parts or loading larger batches of our low/medium-volume range of parts, and to take measurements in a rapid CNC mode. In addition to the machine’s non-contact inspection capability, the flexible Venture Plus also has a Renishaw TP 20 measuring touch probe, allowing us to make accurate physical measurements when the need arises. Venture Plus utilises an all aluminium bridge type construction, resulting in both low inertia and reduced thermal mass. Air bearings are used on all axes, whilst a granite Y beam is used for increased accuracy. This ensures that the machine will expand and contract uniformly with temperature changes, resulting in minimal distortion and errors. Ambient temperature can be compensated for within the Fusion software making VenturePlus ideal for use on the shop floor. Advanced Venture Plus features include segmented programmable LED lighting, high resolution 0.5μm scales for increased accuracy, scanning & best fit features, autofocus, Renishaw TP20 touch probe joint and integral zoom optics. Whilst Baty’s easy to use software includes advanced teach and repeat programming, CAD import / export, fully dimensioned part view, one click output to Excel™ and an SPC facility. For more information on Baty's Venture Plus click here.